Anuradhapura, one of Sri Lanka’s eight UNESCO World Heritage Sites, is a must-see for travellers interested in ancient history. Anuradhapura had been the island’s capital since the earliest period of Sinhalese history and remained to be the by far largest city and royal residence of Sri Lanka fourteen centuries. For almost one and a half millennia, the history of Sri Lanka was essentially identical with the history of the Anuradhapura kingdom. 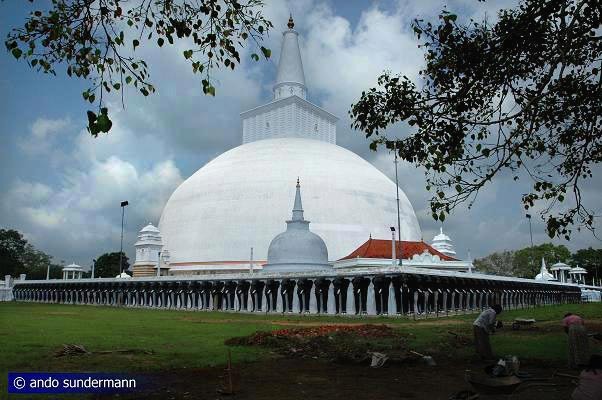 Today, Anuradhapura is a sacred city for Buddhists from all over the world. For western travellers, Anuradhapura is the largest excavation area and has the largest ancient monuments and some of the most celebrated works of Buddhist art in Sri Lanka. Indeed, Anuradhapura is one of the major cultural heritage sites and one of the most evocative places in tropical Asia at all. In antiquity, Anuradhapura was the Indian subcontinent's most important settlement south of the Gangetc plains. However, you can not compare Anuradhapura to other well-known ancient temple cities in Asia. Hampi in India, Bagan in Myanmar, Sukothai in Thailand or Angkor in Cambodia have much larger temple buildings which are in a better state of preservation. The reason is: Anuradhapura is actually one millennium older than those attractions of India and Southeast Asia. Anuradhapura had fallen into decay already before the heydays of Angkor and Bagan and before the Vijanagara empire (Hampi excavation) in southern India and a first Thai kingdom (Sukothai) even existed. Nevertheless, even today the world’s largest massive brick structures can be seen in Anuradhapura, all of them fully restored now. These dagobas (stupas) of Anuradhapura’s three main monasteries - Mahavihara and Abhayagiri and Jetavanarama - surpass all earlier Indian examples in size, and never again have such huge stupas been built anywhere else in the Buddhist World. For Buddhists, Anuradhapura’s main attraction is the sacred Bo-tree. This is the earliest dated man-planted tree of the entire world. It is a sapling of the original Bodhi-tree from Bodhighara, under which the Buddha found enlightenment. Regrettably, the original Bodhi-tree in Bodhighara does not exist any more. Actually, there is a Bodhi-tree at the original place now, but the one you can see in Bodhighara today is indeed grown from a sapling of the Anuradhapura Bo-tree. So in a sense, the Buddha’s tree of enlightenment went forth and back between India and Sri Lanka, the Anuradhapura Bo-tree being in fact the oldest one still existing. That’s why the tree is so highly venerated and attracts so many pilgrims from all Buddhist countries. Anuradhapura plays an important role in Asia’s Buddhist history anyway. In the first millenium C.E. Anuradhapura’s monasteries belonged to the major centres of Buddhist schilarship and monk education besides northern India’s famous Nalanda “university” in Bihar. And there is even one more superlative for Buddhists Anuradhapura has to offer: The “Samadhi Buddha” statue is one of the most ancient and most venerated Buddhist sculptures at all. So you will understand: Anuradhapura is a great name in the Buddhist world and a pilgrimage place even today and one of the most important historical sites in Asia. 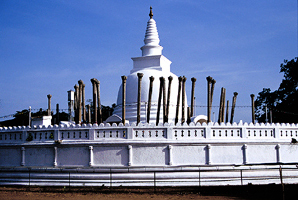 Furthermore, Anuradhapura’s most ancient dagoba named Thuparama contains the very first original Buddha relics brought to Sri Lanka. So it should come as no surprise for visitors: Frequent ceremonies give Anuradhapura a religious vibrancy that’s not a folklore show for tourists but authentic Buddhist life. However, there are also many silent and picturesque places in Anuradhapura, making a stay very pleasant for those visitors, who are not in a hurry. There a garden areas and ancient tanks and shadowy woods, strolling around in Anuradhapura can be very delightful and even relaxing. There are really enough places of interest in this huge archaeological area that are not crowded but really charming. My own guest house is a tranquil place in only 10 km distance of the Sacred City of Anuradhapura, which is the official name of the World Heritage Site and of the excavation area. Anuradhapura New Town, today’s capital of the North Central Province, is located a few kilometres south of the historal site. Ancient Anuradhapura is situated 220 kms away from Sri Lanka’s capital Colombo, namely in the northern plains belonging to the island’s dry zone, and just at the north-western corner point of Sri Lanka’s historical area called “cultural triangle”. Anuradhapura became the first major capital of the Sinhalese people as early as in the 5th century BCE, only a few generations after the arrival of the first Sinhalese migrants led by the legendary hero Vijaya. One of his companions called Anuradha is said to have been the founder of Anuradhagama, meaning “Anuradha’s village”, which later on was named “Anuradha’s city”: Anuradhapura. But it was the Sinhalese King Pandukabhaya who for the first time declared Anuradhapura the capital of the island. 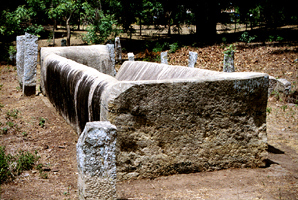 However, archaeological evidence proves, that Anuradhapura had already been the most important settlement in this part of the island already for centuries, even before the arrival of the Sinhalese. During the reign of Pandukabhaya’s grandson Tissa, later on called Devanampiya-Tissa, Buddhism was brought to Sri Lanka by missionary Mahinda, the son of India's famous Emperor Asoka. According to Sri Lanka’s ancient chronicles, this happened 236 years after passing a way of Load Buddha. Ever since, the Sinhalese kings of Anuradhapura oversaw the golden age of Sinhalese cultur. The city’s fame spread to the Roman empire and, even Roman coins have been found in Sri Lanka. But the wealth of the Sinhalese kingdom and the treasures of its Buddhist monasteries time and again also attracted foreign invaders, many of them only looting the city, others conquering it to reign themselves. 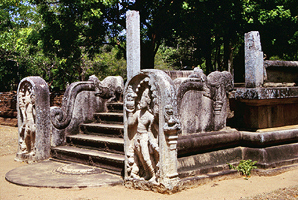 In those periods of turbulences, Anuradhapura’s Sinhalese kings usually fled to the south of the island, this area called Rohana in the Pali chronicles or Ruhuna in Sinhalese was prooved to be a perfect place for operations to regain power in the cultural heartland in the northern plains. Despite those interferences and wars and also sometimes insurrections of local rulers or of rivalling factions of the royal family, Anuradhapura, seeing almost 130 successive rulers, maintained its preeminent position until the end of the 10th century CE, when it was finally laid waste by Tamil invaders, making the northern plains of Sri Lanka a province of the Southindian Chola Empire and shifting the administrational capital to Polonnaruwa. Thuparama, though not large in size, is one of the most venerated Dagobas in Sri Lanka, since Mahinda Thero, the missionary sent by King Ashoka brought a collarbone of the Buddha from India to be enshrined by the converted King Devanampiya Tissa. Therefore, Thuparama is considered to be the first dagoba built on the island after the introduction of Buddhism. Indeed, the brick strcuture is definitely one of the earliest Buddhist monuments found in Sri Lanka. 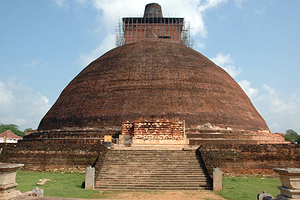 In later centuries, the Thuparama dagoba was expanded to a typical Sinhalese circular temple of the “Chetiyaghara” type, providing a roof as shelter for pilgrims. The ancient stone pillars supporting that roof still surround the Thuparama today. Their capitals are decorated with carvings depicting lions and dwarfs (singhas and ganas). Due to its original Buddha relics, Thuparama is often visited by pious Buddhist pilgrims. Mahavihara was the first Buddhist monastery in Sri Lanka, founded by missionary Mahinda in the precinct of a former royal garden of King Devaampiya Tissa. It became a centre of Theravada Buddhism, the classic teachings of the Visuddhimaggha were written here by Buddhghosa, also Sri Lanka's Mahamsa chronicle is from the Mahavihara. 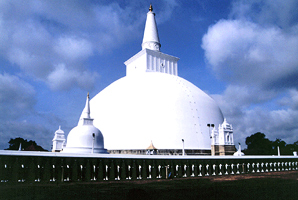 The white dome of the ancient monastery's main dagoba, Ruwanwelisaya, is the landmark of Anuradhapura and one of Sri Lanka’s most famous monuments. It has already been restored and painted white in the times of Buddhist revival during the British colonial period, when archaeological research began. In those days, Ruwanweliseya was the largest building in South Asia. The Ruwanweliseya was constructed by Sri Lanka's heroic king Dutthagamani (Dutugemunu) but finalized under his brother and successor Saddha Tissa. Anuradhapura’s Bo-tree (Sri Maha Bodhiya), beloging to the Mahavihara complex, is the second most sacred site in Sri Lanka, after the Temple of the Sacred Tooth in Kandy. As already mentioned, this Bo-tree is a sapling of the original Bodhi-tree under which the Buddha gained enlightenment, and has been continuously guarded for over 2,000 years, making it the oldest historically authenticated tree in the world. Shoes must be left near the entrance of the compound. Close to the Bo-tree, there are hundreds of pillars once carrying the famous Loha Pasada, the “Brazen Palace”, which served as a monastic headquarter. It was named after its brazen roof. A copy of the famous Loha Pasada, which was once renowned as a centre of Buddhist scholarship, was built in the 19th century in the very centre of Thailand's capital Bangkok. The Loha Pasada museum in Bangkok stresses the strong historical ties with Sri Lanka. The so-called citadel was once the fortified centre of the city, including the royal palace and the quarters of merchants and of craftsmen. Not much can be seen from the ancient city, since all secular buildings were built of perishable materials such as wood and have disappeared in the course of the centuries. However, one royal complex from the later Polonnaruwa period can be seen near the souther gate of the citadel. Even more interesting is the sacred area of a former tooth relic temple, though today Sri Lanka’s first “Dalada Maligawa” is not as impressive as later ones. Only some columns and foundations can still be found in the jungle. However, in its vicinity there is a perfect example of an ancient “rice boat”, a huge monolithic tub called Mahapali. Monks from all over the town received their meals here as a gift of the king or other highly respected donors. The Abhayagiri monastery just north of the citadel was founded by King Vatthagamani Abhaya, known as Walagambhu among Sinhalese people. Vatthagamani hed to flee after an Tamil invasion but vowed to consecrate this area in Anuradhapura as a gift to the Buddhist order after his return. The Abhayagiri became the largest monastery in Anuradhapura, its dagoba even surpassing the Ruwanweliseya. The Abhayagiri order, together with the king, was in charge of the tooth relic after it arrived on the island. When the famous Chineses pilgrim Faxian lived in Anuradhapura, he counted 5000 monks living in the Abhayagiri monastery. 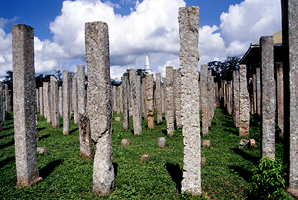 In recent decades, the Abhayagiri complex has been the main focus of the UNESCO-sponsored cultural triangle project in Anuradhapura. Indeed, it’s the most interesting archaeological excavation area in Anuradhapura for today’s visitors. Queen’s Palace is a phantasy name for a temple structure inside the Abhayagiri complex. Even more confusingly, the building is also called Mahasena's palace, Mahasena being the name of a king. But originally, this was not a palace, but an image house. Today, not much can be seen of the building and nothing of its statue any more. Nevertheless, the Queen’s Palace is the site of one of Sri Lanka’s most celebrated works of art, namely the largest classic Anuradhapura moonstone, sometimes called the “most beautiful doormat of the world”, since it is placed on the ground in front of the former temple entrance. It’s welcoming the visitor and inviting him to do the next steps on the path of salvation when entering the temple itself. The interpretation of the carvings of this Anuradhapura moonstone will never come to an end, because of its abundance in deeper symbolism. The world-famous Samadhi Statue is a three-dimensional sculpture situated at the so-called Mahamevnawa Park close to the Abhayagiri complex and just north of the citadel of Anuradhapura. The Buddha is depicted in the classic position called Dhyani Mudra, showing the gesture of meditation. The sitting posture of the legs is called Virasana, which mean's "victory seat". 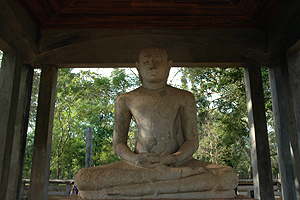 The monolithic statue of Anuradhapura's Samadhi Buddha is carved from granit. It measures not more than 8 feet in height. But it’s the serinity of the statue’s expression which is most admired by Buddhist and even non-Buddhist visitors from all over the world. The statue became famous, because the non-religious independence activist and later first Indian Prime Minister Nehru used to meditate with a picture of this Sri Lankan Buddha statue, when he was imprisoned by the British. 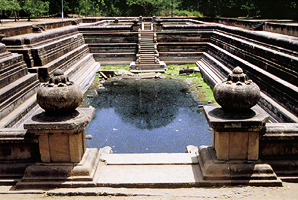 The classic specimen of a typical ancient Sinhalese bathing pool is the pair of ponds known as Kuttam Pokuna. The larger pool measures 132 ft by 51 ft, while the slightly smaller pool at the northern side is 91 ft by 51 ft. The simple design is nevertheless an architectural masterpiece concerning elegance and proportions of the stone structure and the quality of craftsmanship. The Kuttam Pokuna is also considered to be a major achievement of hydrological engineering, since it used natural water pressure effectively for a natural filter system cleaning the water before it pours into the first of the two ponds. The famous twin ponds are not far away from the Samadhi Buddha statue and situated very close to the main junction in the northern half of the Anuradhapura archaeological zone. Built in the 3rd century on land formerly belonging to the Mahavihara, the Jetavanarama monastic complex comprises the most voluminous stupa ever built, originally reaching a height of 122 metres (400 feet). The giant stupa of Jetavanarama was restored perfectly well in the first decade of the 21st century and now again gives an impression of its ancient glory. The Jetavanarama monastery, though it’s construction once was a result of schism and sacrilege, became one of Sri Lanka's three leading monasteries, which were in control of many villages and tanks and paddy cultivation areas throughout the Anuradhapura kingdom. 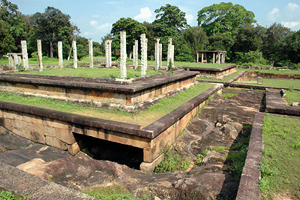 Jetavanarama, inhabited by thousands of monks, found royal sponsorship of many different Anuradhapura kings in later centuries. The Jetavanarama order was always a rival of the more ancient Mahavihara. That's the reason why it has not a good reputation in the Mahavamsa Chronicle, which was written in the Mahavihara. Isurumuniya is an unusual temple situated in the southern part of Anuradhapura’s archaeological area. 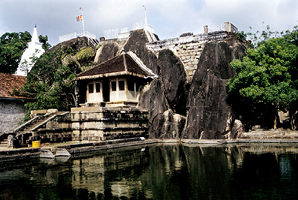 It’s a rock temple at the shores of the ancient tank called Tissa Wewa. 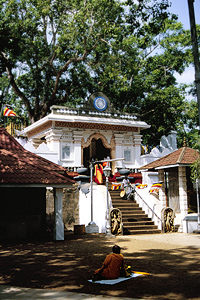 Sri Lanka’s renownd historian S. Paranavitana interpreted as an ancient place of worship for weather deities. 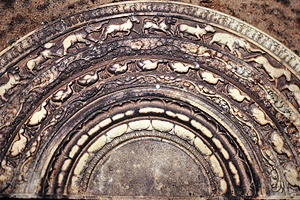 Isurumuniya is famous for its carvings. One of them shows a man with a horse, which is a very rare sujet in ancient Sinhalese art. Presumably it’s a depiction of Ayanar, a popular local deity popular in Southindian villages. Even nicer is a depiction of playing and bathing elephants at the foot of the Isurumuniya granite boulder, just at the temple pond. The most famous carving is now on display in the Isurumuniya temple’s museum. It’s the so-called “Isurumuniya Lovers”, believed to be a portrait of Sri Lanka’s “Romeo and Juliette”, namely Prince Saliya and his beloved maiden Ahokamala. The area of the Anuradhapura’s western monasteries is most probably the ancient area called Tapovana, which served as a hermitage for forest monks. Situated west from the Abhayagiri complex, on the opposite side of the Basawakkulama tank, these western monasteries were a remote area outside the city centre, used as a burial place in ancient times. All westen monasteries of Anuradhapura show the same simple and strange design of monastic architecture that can also be found at Ridigama. Charakteristics of complexes of these so-called Pamsukulika monks are complete absence of stupas, Buddha images and Bo-trees. Instead of them, you will find double-platforms called Padhanagaras. They once served as meditation and maybe welling areas of these ascetic forest monks. The only parts of a Pamsukulika monastery that shows ornate carvings are the toilets. Surprisingly it’s the god of wealth, Kuvera, who is depicted on some of these decorated urinal stones.